Filmmaker James Cameron stands with Explorers Club president Alan Nichols at the March 16, 2013 Explorers Club dinner. 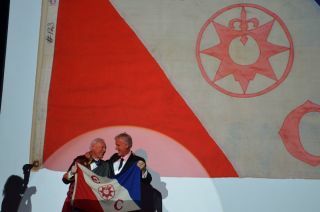 The two are holding the Explorers Club flag Cameron took on his 2011 journey to the deepest spot in the ocean. NEW YORK — Some of the world's most pioneering explorers, including two Mercury astronauts, celebrated the thrill of exploration and the lure of the unknown at the annual Explorers Club dinner here on Saturday (March 16). Honoree John Glenn, a former senator and the first American to orbit Earth, summed up the mood while accepting his Legendary Explorer Medal. "Exploring is another way of saying curiosity in action," he said. "If you think about it, there haven't been any advances made in civilization without someone being curious about what's out there, what's around the next bend in the road or over the next hill or beyond that forest over there. This kind of curiosity is far more than just wanting to go and look at some new scenery someplace — it's an attitude, and something that I think has been key toward lifting this country into its leadership position in the world." Fittingly for a gathering of such intrepid explorers, the food at the gala, held at Manhattan's Waldorf Astoria hotel, was far from pedestrian. The appetizer spread included roasted camel, tarantula fritters, and a carving station of muskrat, goat and beaver. Deserts featured cakes topped with crickets and mealworms. Glenn spoke alongside his fellow astronaut Scott Carpenter, who became the second American to orbit Earth when he flew on the Aurora 7 spacecraft in 1962. Both men were among NASA's first seven astronauts, chosen to fly the Mercury program that laid the groundwork for the Gemini and Apollo missions to follow. Carpenter accepted a Legendary Explorer Medal as well. "We were all serving our curiosity, but we were serving our country and we were serving our belief, which is justifiable today, that preeminence in space was a condition of this nation's freedom, and that is what drove us, along with our curiosity, to do what we did in those early important days," Carpenter said. Space pioneers weren't the only explorers on hand that night. Other award winners include Chhiring Dorje Sherpa, who has summited Mount Everest 11 times, and was honored for performing a daring rescue that saved a man's life on the Pakistani mountain K2 in 2008. And film director James Cameron, who traveled to the deepest spot in the ocean ­— the Mariana Trench 7 miles down — inside a robotic submersible in March 2012, was awarded the Explorer's Club Medal. "Curiosity acted upon is what exploration is," Cameron said. "I think there is a moment for all of us explorers where we have to get up and do something about it; we're not content to be observers. There's a moment where we realize, we came here to play." Though the feats accomplished by the explorers present varied from expeditions to land, sea, air, and space, the central motivations they cited were strikingly similar. Jim Whittaker, the first American to climb to the top of Mount Everest, poses with the gear he wore on that expedition at the 2013 Explorers Club dinner. "Humankind is curious," Jim Whittaker, the first American to climb to the summit of Mount Everest, told SPACE.com. "They want to know what the hell is over the horizon or what is on the other side of the mountain, and also where the hell do we come from, what's our makeup? If there's an ocean, we cross it, if there's a disease, we cure it, if there's a wrong, we right it, if there's a record, we break it, if there's a mountain, we climb it." And one explorer who was still partway through his expedition — Canadian astronaut Chris Hadfield — managed to call into the festivities from his temporary home on the International Space Station. Hadfield thanked the explorers, especially the legendary astronauts, for paving the way for his own explorations. "Thank you for your vision, for your dedication, for your inspiration," he said while floating in his spacecraft, via video message. "We absolutely stand on your shoulders."